To make the curried split peas, soak the peas in water overnight. Heat the oil in a pan with the ginger, garlic, onion and whole chillies over a medium heat and fry for 5–6 minutes. Add the garam masala and a pinch of salt. Drain the peas and add to the pan with 500ml/18fl oz water. Simmer for 20 minutes until very tender, adding more water if they start to look dry. Meanwhile, make the coriander chutney. Place the coriander, salt, sugar, lemon juice, dry-roasted cumin seeds and garlic in a food processor and blend until combined. Add the yoghurt and blend again until a smooth green sauce. Adjust the seasoning to taste. Set aside until ready to serve. Add the tomatoes to the peas and another splash of water and cook through for a further 5 minutes. Stir in the lemon juice and fresh coriander and keep warm until ready to serve. To make the chips, place the potatoes in a pan of cold, salted water and bring to the boil over a high heat. Simmer for 8–12 minutes, or until the potatoes are al-dente but firm. Heat a deep-fryer to 150C (CAUTION: hot oil can be dangerous. Do not leave unattended). Meanwhile, to make the fish, season the fillets with the spices and lemon juice in a clean bowl and marinate the fish for at least 5 minutes. Drain the potatoes and place under cold, running water until cool. Drain again and pat dry with kitchen paper. Deep-fry the chips for 5–6 minutes, or until yellow tinged. Remove and increase the temperature to 180C. Fry the chips again for 5 minutes, or until golden brown. Drain and sprinkle with the dry spices and keep warm until ready to serve. Combine the flours, salt, carom and pepper in a clean bowl then whisk in the beer until smooth. Coat each piece of fish in the batter and deep-fry for 5–6 minutes, or until golden brown, turning halfway. Blot dry on kitchen paper. 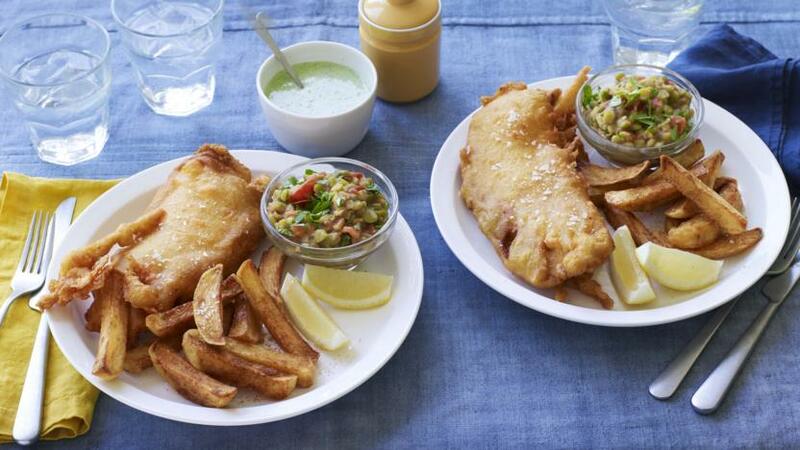 To serve, place a piece of fish and a pile of chips between four plates, add a squeeze of lemon and serve with the coriander chutney and peas.